Things that make my children happy make me happy. Things that help make my life easier (especially with the children) make me happy. 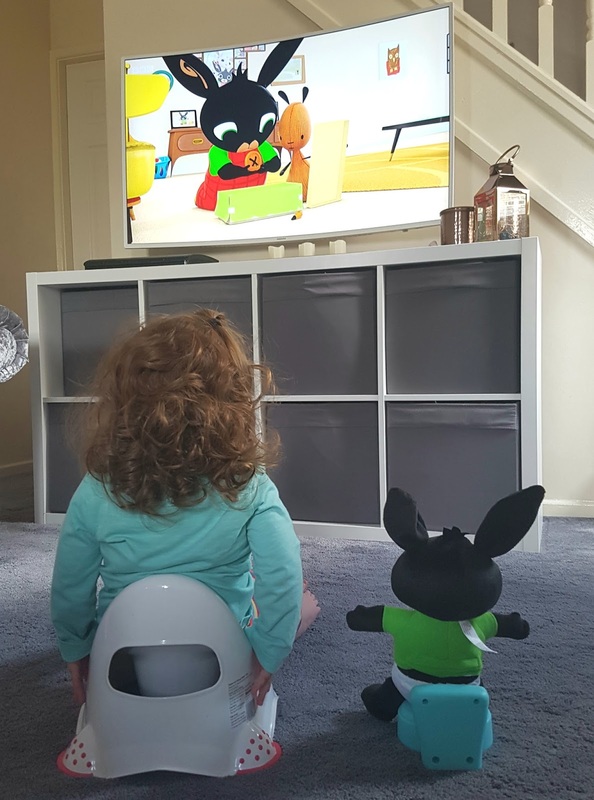 So when I was contacted recently and asked if I would like to have a potty training help, something interactive, soft, cute, and cuddly sent to me for Willow, well how could I say no. And a fairly huge sized Toilet Train Bing at that too. Now Willow blooming loves Bing and even when she spotted just the picture of this toy on my phone she went a little ga-ga over it. But I mean what's not to love really - he's cute, he's quite funny, he says words like "poo" and "wee" and now, well now he is learning to use his potty - something Willow will be starting with fairly soon. ...we got stuck into looking at just how this cute little toy could help with our potty training journey. Well it's all about the encouragement you see - the encouragement and the copying - and we all know just how much the little ones like both of these things. Willow picked it up really quickly and was dashing in and out putting him on his potty whenever he needed - it's really far too cute. I actually really love that by showing Bing at ease and at peace with his little toilet flush it could potentially help Willow accept that loo flushing is OK when she gets to the toilet using stage too - it's something I really don't want her to become afraid of, and now, thanks to Bing Bunny I reckon we'll be just fine. I actually couldn't be happier that we have this fab little toy in our home and would gladly pay the price of £31.99 for him - not only is it cute, sweet, cuddly and helps Willow to learn and interact but he is also very well made and the potty training concept behind it is brilliant too. It is really going to help us with this next huge stage with Willow that's for sure. It really is "A Bing Thing"